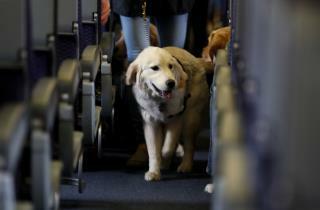 (Newser) – If you're planning a flight longer than eight hours, Delta Air Lines says you can't bring an emotional-support animal with you. The rules for pups are getting tighter, too. Neither support animals nor trained service animals will be allowed on any Delta flights if they are under 4 months old. Delta says the changes take effect Dec. 18. The airline says exceptions will be made until Feb. 1 for customers who already bought a ticket and asked to bring a support animal, the AP reports. True support animals are trained and well behaved. Just because you purchase an ESA certificate online does not make your pet qualified. It's about time the airlines are drawing a line on the subject. Good. It's about time they started actually cracking down on this chit.... I am 100% on board with actual trained service animals accompanying those truly disabled folks or vets with PTSD... the rest of you will literally NOT DIE if you have to put FiFi in a crate in the cargo area. Gimme a break. Enough is enough. Snowflake Syndrome.